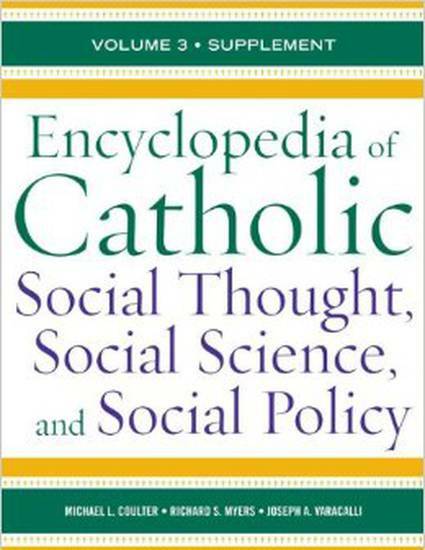 The two original volumes of the Encyclopedia of Catholic Social Thought, Social Science, and Social Policy were published in 2007. Those two volumes included 848 entries from nearly 300 contributors and included a wide range of entries in three general categories: entries exploring Catholic social thought at a theoretical level, entries reflecting the learning of various social science and humanistic disciplines as this learning relates to Catholic social thought, and entries examining specific social policy questions. This third, supplemental volume continues the approach of the original two. Kevin P. Lee, Hannah Arendt, in Encyclopedia of Catholic Social Thought, Social Science, and Social Policy. Ed. Richard S. Myers, Richard S., Joseph A. Varacalli, Michael L Coulter, et al. Lanham, MD: Scarecrow Press, 2012.